This cheesy, creamy, Butternut Squash Mac & Cheese recipe is kid-friendly dinner idea. A one-pot meal that’s packed with flavor. 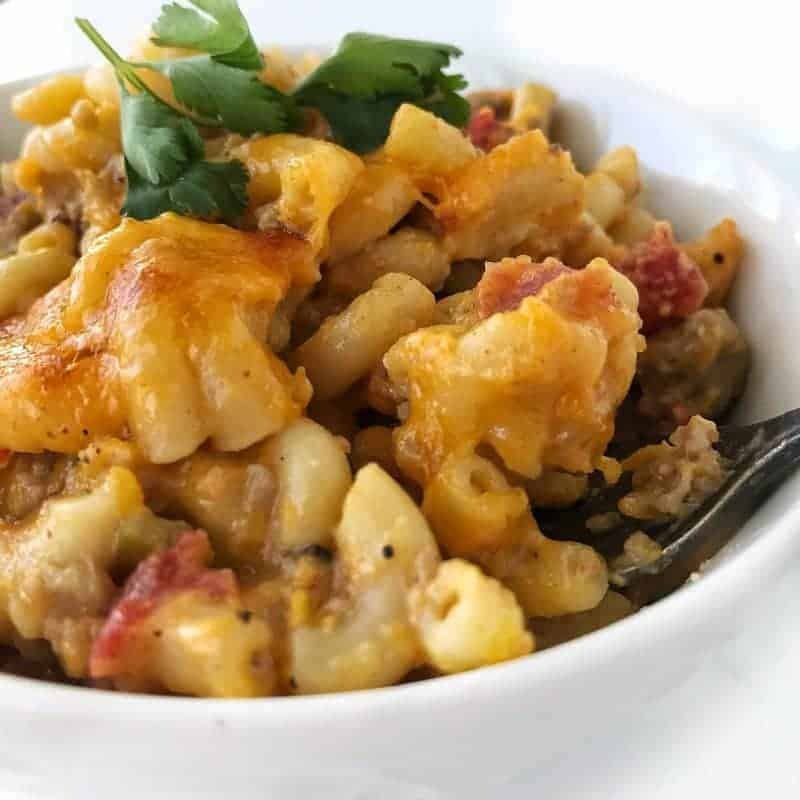 This Butternut Squash Mac and Cheese with pork sausage is one of my families favorite meals. When I tested this recipe I made it at least 4 times in 2 weeks. This butternut squash pasta is easy to make and is really delicious. Feel free to use canned squash or fresh squash, both work great. 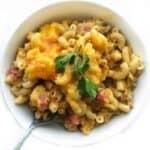 This recipe would be really good swapping the butternut squash out for canned pumpkin or go ahead and skip it all together for a delicious mac and cheese. If you like this recipe, you should check out my Butternut Squash Soup and Caramelized Butternut Squash recipes. Check out the video for step by step instructions or keep reading to find out exactly how to make this delicious butternut squash pasta. Brown pork sausage in a large oven safe sauté pan, drain and return meat to pan. 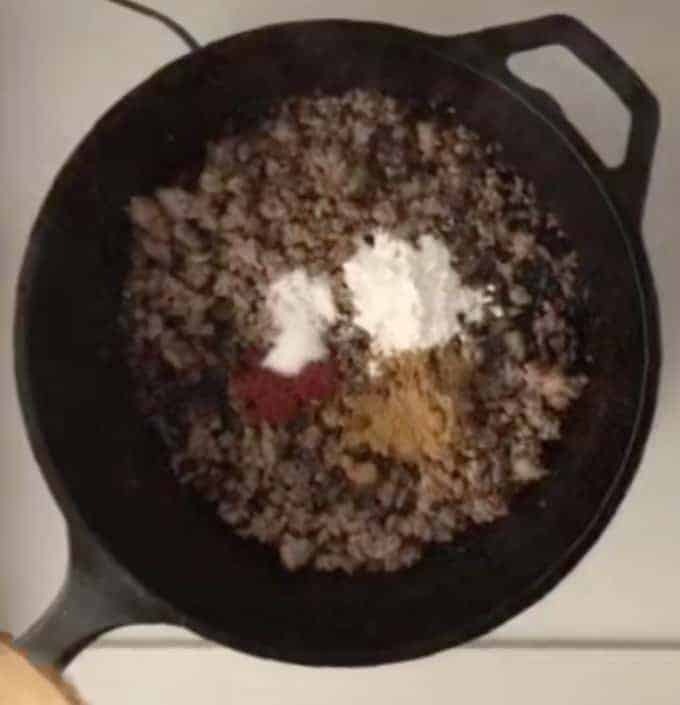 Stir flour, cumin, chili powder, and salt into cooked pork sausage. 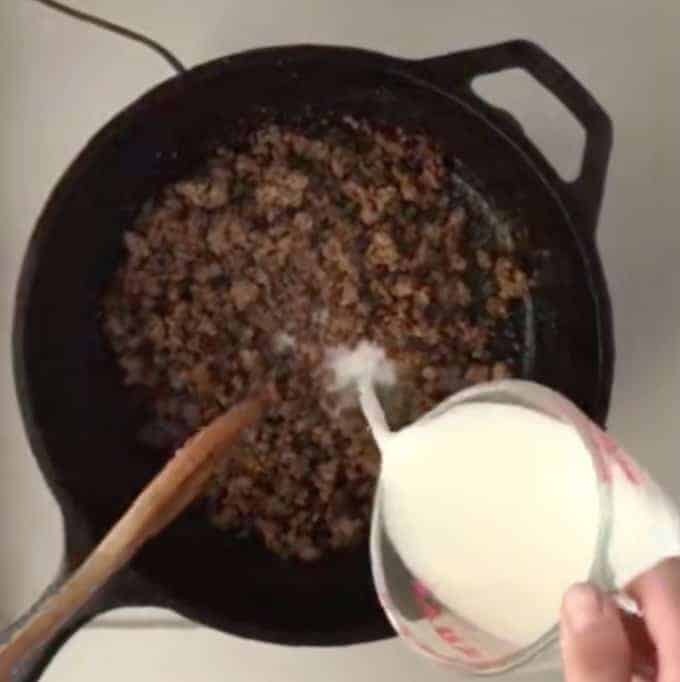 Over medium-high heat, slowly add milk, stirring well. 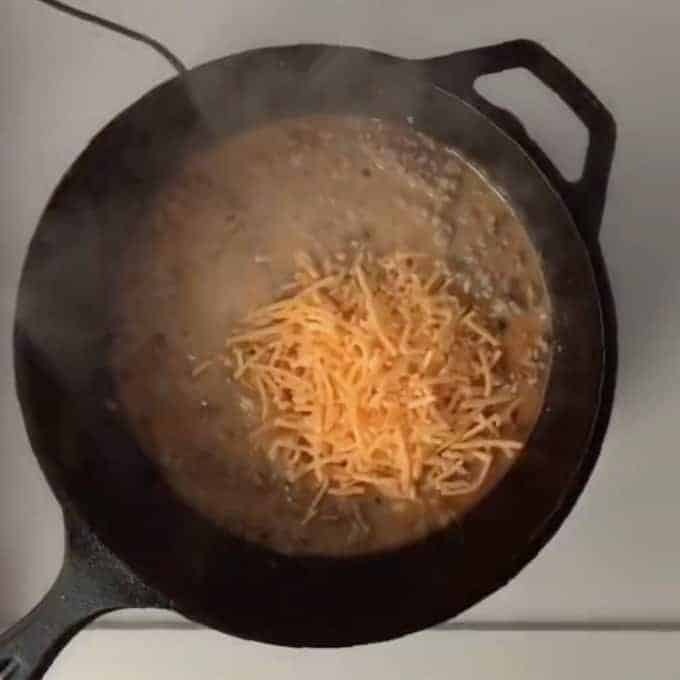 Add 4 ounces of cheese, stirring until melted. Turn heat off. Whisk in eggs. Turn heat to medium-low and cook until thickened, stirring constantly, about 2 minutes. Add drained tomatoes, sour cream, and squash. Add cooked pasta, mix well. Top with the rest of the cheese. Broil for 3-5 minutes, or until cheese is bubbly and slightly browned. Start by browning the meat, draining, then adding the spices to the oven safe pan. After the spices are added, slowly stir in milk, stirring as the sauce thickens. Add half of the shredded sharp cheddar cheese. Kitchen Tip: Sharp cheddar is used because of its strong flavor. Because of its strong flavor, you can use less cheese saving calories and fat. Turn heat off. 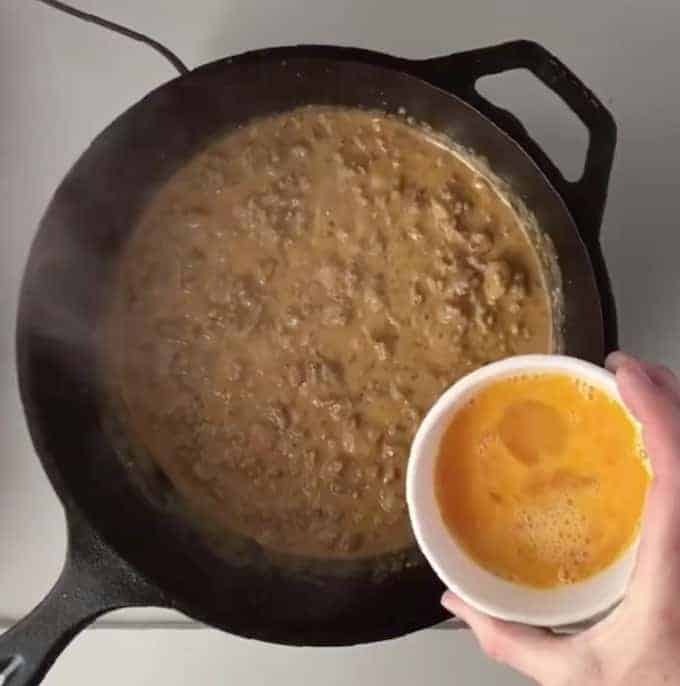 Add whisked eggs to the meat mixture, stirring constantly until well blended. 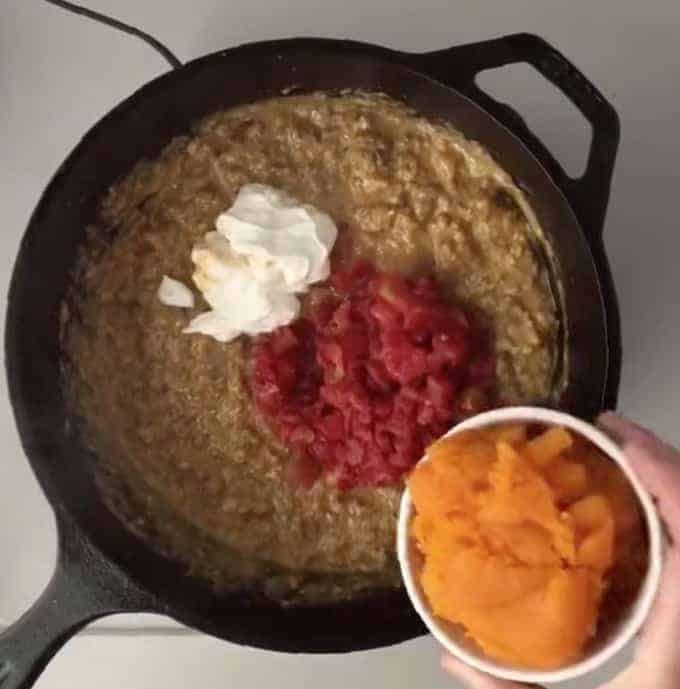 Stir in the sour cream, tomatoes, and butternut squash until well blended. Add cooked pasta and stir into the meat mixture. Top with the rest of the shredded cheese, then broil until the cheese is melted and bubbly. This creamy casserole will become a family favorite dinner. A one pot meal that is packed with flavor. Butternut squash blends seamlessly into this cheesy Mac & Cheese recipe for a delicious spin on the classic dish. Turn heat to medium-low and cook until thickened, stirring constantly about 2 minutes. Optional Garnish: Cilantro, chives, sour cream, or fresh tomatoes. Butternut Squash Mac and Cheese recipe was adapted from a recipe I found in Food Network Magazine for Mac And Queso With Sausage. Thanks for the tips! My baby is still under a year old but I’m already thinking ahead and hoping to instill a love of vegetables in her! Good job on thinking ahead and getting started at a young age with your daughter, Julie! Let’s face it…mac and cheese is not usually the healthiest dish. You have really boosted the nutritional value as well as the flavor in this recipe. Kudos!! As far a veggies vs fruit…I tend to eat more veggies, but my daughter loves fruit. Fortunately she likes veggie, too. I really like butternut squash. 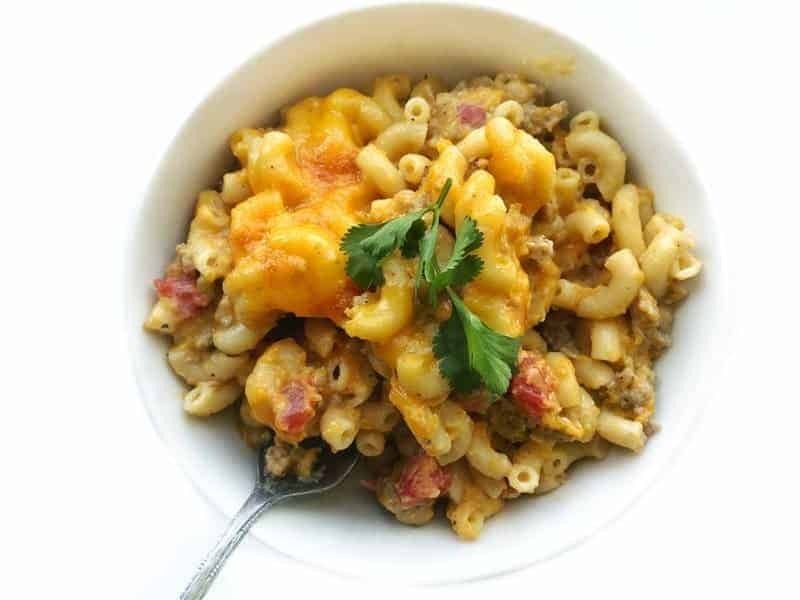 Adding veggies to popular foods like macaroni and cheese is actually a great idea. Thanks Pam! The Mac and cheese works great with this squash – it is really good! This dish sounds like it has a very interesting flavor. We have put veggies in mac and cheese but it’s the usual ones like broccoli, carrots, etc. I love butternut squash very much. My kids usually prefer them roasted and in soups. I must try this soon. I think they will like this. LOVE butternut squash mac and cheese! 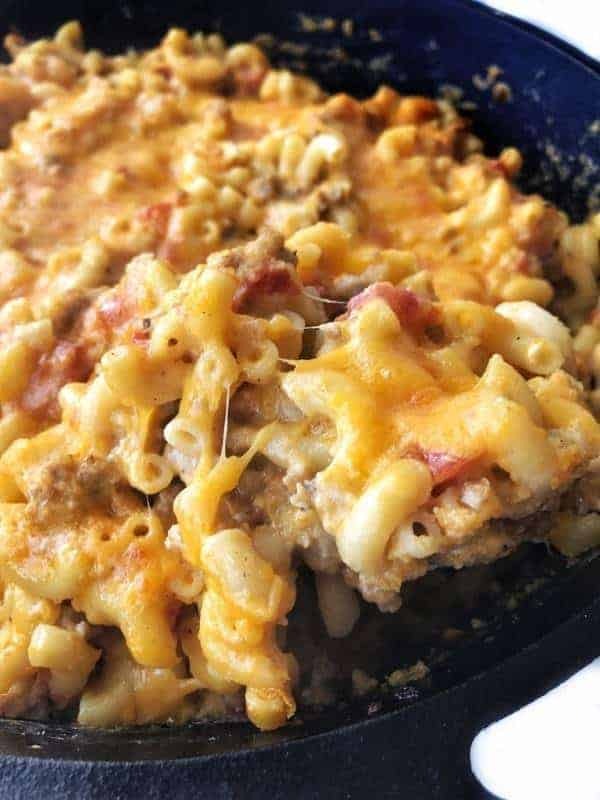 Well, mac and cheese in any form, basically 😉 This looks delicious! Saving the recipe for later! One Pot recipes are definitely such a big time saver and I love butternut squash. I do make something very similar but need to try the one with elbow pasta. I agree, Molly. The less pots and pans the better! I definitely need to eat more veggies. 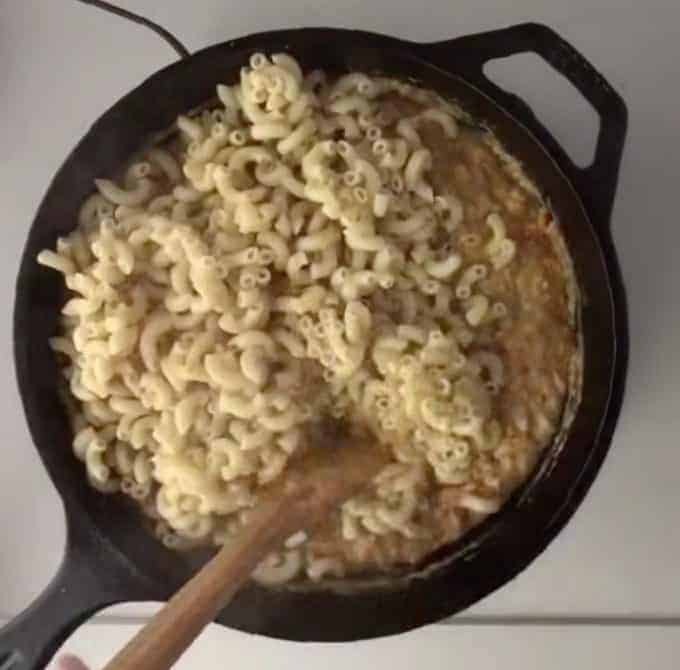 This mac and cheese looks really really good. I would try this for sure. This is a really easy way to get in more of those veggies in a delicious way! What a great idea!! Kids do have a tendency to turn up their noses when it comes to veggies. Just add them to some dish they can’t resist and by golly they gobble it down. Great inspiration. That is my trick and I’m sticking to it 😉 Thanks Marisa! Looks like proper comfort food indeed! My whole family loves mac n cheese but haven’t tried making it with butternut squash and now we know we should! I love this recipe!! Perfect comfort food, lightened up.. the pork has to add such a great flavor to this and using the butternut squash is brilliant!! Thank you, Heather! And the pork does add a wonderful flavor to the dish. We are reversed here too – we eat lots of fruit but have a harder time with vegetables. But we def love mac and cheese! Will have to give this a try! This was such a hit! Thanks for the great recipe!